Here is that report I forgot to attach to last posting. Still in a drought condition here with little or no rain to drag about. Weather satellite images don't show much hope for any appreciable rain coming our way. Great for the tourists visiting, sunny days with nice water temperatures. A bit warm for them walking around in town doing the shopping/sightseeing thing. 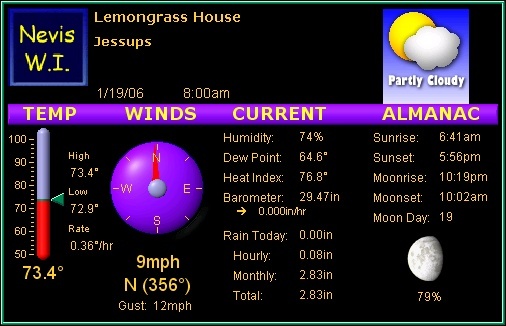 Attached the summary report as of this time from the weather station for those interested. Need rain !!! Send any extra rain you don't want. I'm recording less then 1.0 inch of rain for this month. Almost a repeat of last year. Grass is browning, ground is parched, I see the water truck making water deliveries to those empty cisterns. Wondering what April will bring for water? Starting to warm up. Yesterday seemed like a typical summer day....hot and hazy. Weather maps show the possibility of showers passing by today. Then again the last 2-3 days looked like we could get a soaking but never happened. March is setting up to become a repeat of last year with very little rain to date. We've had a 12 day stretch with no measurable amount of water from the sky. The ground is looking parched & the grass is starting to brown up. Although last night we had .16 inches over a 2 hours period bring the monthly total to .48 inches. This will help bring back that "green look". As I type this it is cloudy with the possibility of rain any time. Looking to the weather maps tells me we should be back in the sun in 3-4 hours. Water temps are starting to warm up a bit. Pool water is now at 81 degrees F, up from a chilly 77 degrees. OK go ahead and feel sorry for us down here. That's the news from Nevis this time around. Can't say the weather has improved since last post. We're still in that pattern of rain, showers, sun. Not a complete washout but not beach bragging weather either. When the sun does appear for a few hours the temperature moves up to the high 70's/low 80's & feels quite good. Things are growing by leaps & bounds. Rain total for February to date is 2.09 inches. 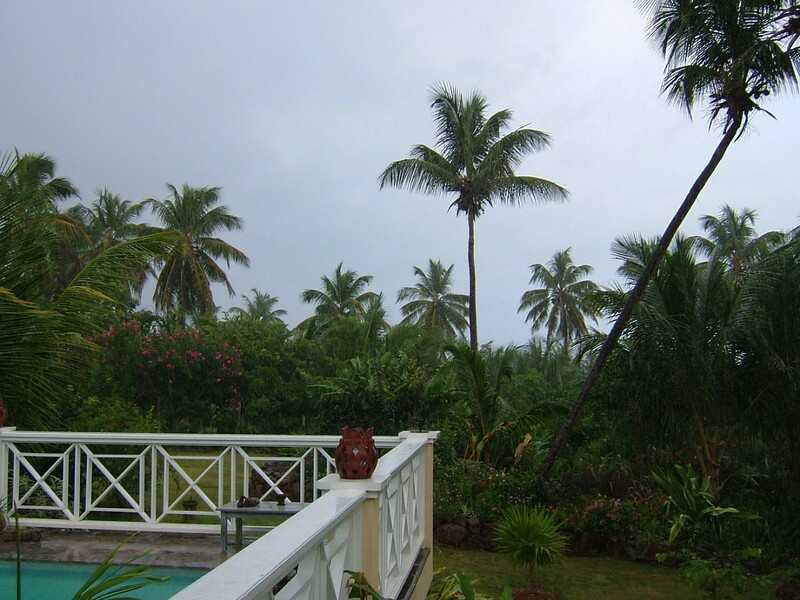 Gloomy weather continues here on Nevis! Seems like Seattle or perhaps London down here. Temps hang around low to mid 70's DAYTIME. Clouds & showers on & off. Beach days far & few between. Don't want to depress anyone so will stop with above descriptions. When fair weather returns I'll post again. Still in the clouds & rain with short breaks of sun now & then. 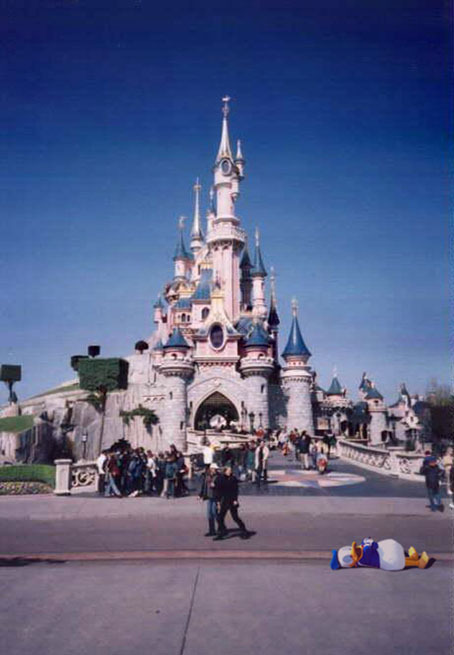 The satellite images aren't too promising either! We seem to be in the path of the trade winds which are bringing all this mess. I'd say it's going to continue for several days. Difficult trying to get anything done in the garden. Looks like a bunch of rainy weather is heading in our direction. If winds don't change I'd say this evening will bring rain, rain, rain. 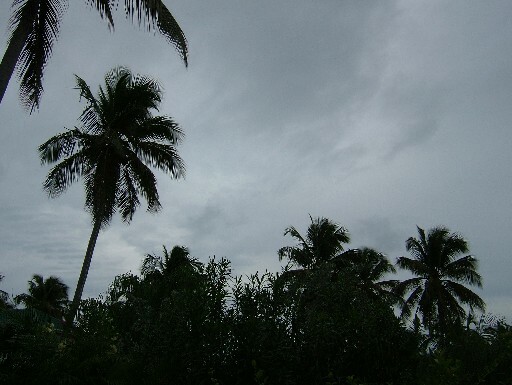 This month has been bring occasional showers day or night. Yesterday was a great beach day with plenty of sun. The party catamaran's from St. Kitts were here at Paradise beach yesterday for the afternoon & it looked like everyone was enjoying the beach & rum punch. "Life's a beach"....certainly true yesterday. January seems to be a normal month. Temperatures are comfortable & rain fall is short tropical showers happening any time of day or night. Ocean water seems cool (to me). Can't snorkel more then 1 hr without feeling cold. Today is one of those perfect weather days! Lots of sun, cool & dry (low humidity). See attached weather sta. summary report. Looks like today will be a washout. Looking at satellite images the movement will take all day to clear our little world. 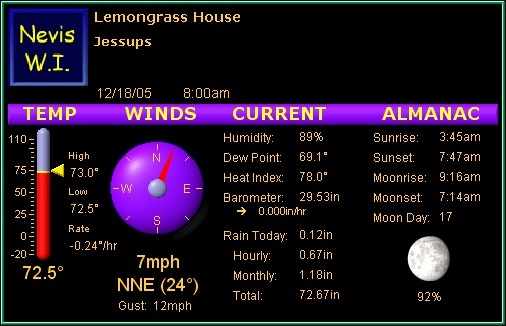 Attached the data from the weather station as of this hour. Also put in a picture from 22,000 mi. You know, the BIG picture. Today is a football day perhaps, wrap some Christmas presents, do some reading, chilling out. The day is dawning with clouds but I think they will clear out in 3-4 hours. Temperature right now is 78 deg F. Wind from NNE at 4-6 MPH. Wait, I see a bright horizon off in the distance. Maybe that clearing is closer then I think. With the satellite image delay & all that stuff I'm probably off by 2-3 hrs. Seems the Christmas winds have let up since yesterday. A quiet Sunday is in store. Weather continues to be great. Ocean waters have cooled down a bit. Christmas winds are here & so is the melodic tones from the wind chime. Easy to work outside all day with hardly a sweat. Got a short but heavy downpour last night...ordered that just to keep the cistern topped up. Happy Thanksgiving Day from Nevis ! 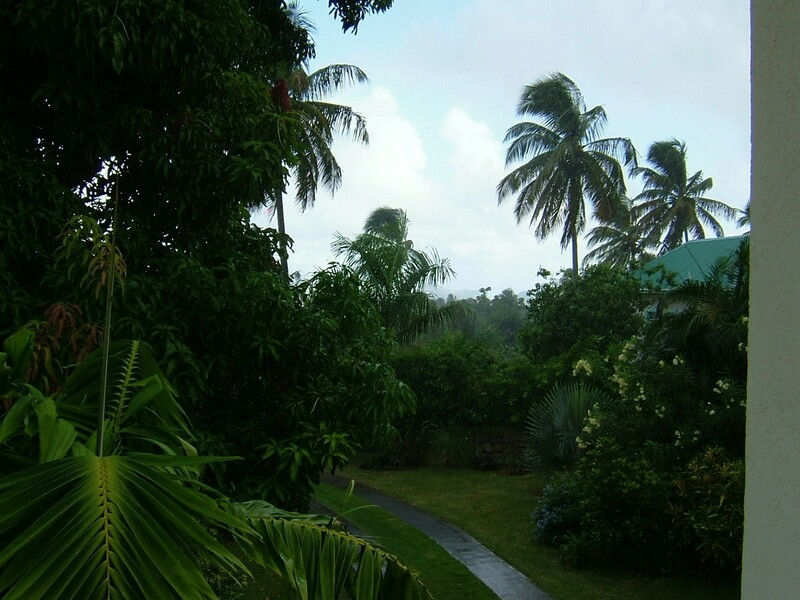 Our beautiful weather continues here in Nevis. Having said that it looks like we may be on the fringes of a small batch of rain creeping ever so close to us. From of all places Puerto Rico. Attached an animated file showing the movement. That's the only way to describe weather on Nevis for the last 3 days. Temperature in the low to mid 80's with low humidity & clear blue skies. No rain, no tropical showers, just great weather. Ah...it feels so good !! OK enough is enough !! Today will remain a cloudy one for most of the day. BUT...there appears to be some hope in the form of sun trying to head our way. I've attached a animated image showing a clearing progress across Puerto Rico in the past two hours. Based on that I'd guess we should see clearing skies in approx 8 hrs. if the trend continues. Lets see how accurate that prediction is? No virus found on outgoing message. Had some wild weather for the past few hours. 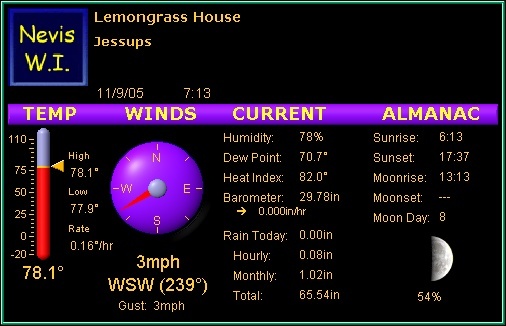 Strong gusty winds with heavy rain, 1.68 inches of rain since midnight. Things are quieter now with no rain & light breezes. Looking at the satellite images this am don't expect any sun today on Nevis. In fact perhaps not even tomorrow? 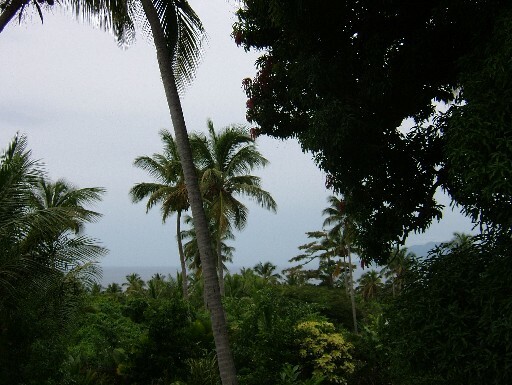 Also the latest report on the "bird flu thing"
Weather on Nevis continues same as last report. Sunny days with an occasional tropical shower. Just like the book says it's supposed to happen. Attached the statistics jepg from the weather station for November. Else all is well. Looking out the window & watching the rain drops here....looking south, blue sky, looking north blue sky & clouds. What gives? 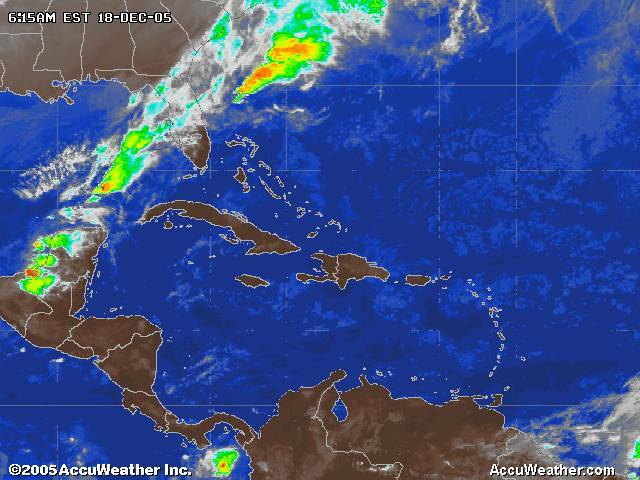 Satellite images show the Caribbean in clear weather? I'm set to view in infrared which doesn't pick up those scattered clouds as well. Switching to visible view does show there are scattered clouds for 100's of miles. So any cloud, at any time, could bump into Nevis Peak, collect some additional moisture & send it back down as a shower. They are short shots of water for the plants!! Overall not a bad deal for visitors traveling here. Yesterday proved to be a almost rain free day except for the brief shower on the major MTV "Tempo" concert in the field....just like Woodstock, well not exactly but still fun. It looks like the weather over us will move away by evening. We are on the extreme eastern edge of the clouds & they are moving away to the north west. After that we should be in for some sunny days with cooler temperatures. What a day.....heavy rain bands with lots of wind gusts. Guess that tropical storm is in the process of forming right around us. Attached a jpeg file of the view from 22,000 miles above us as well as the latest weather station readings from my weather station. Will report again tomorrow as conditions change. Greetings from SUNNY Nevis !!!! Today dawned with blue skies & sun. 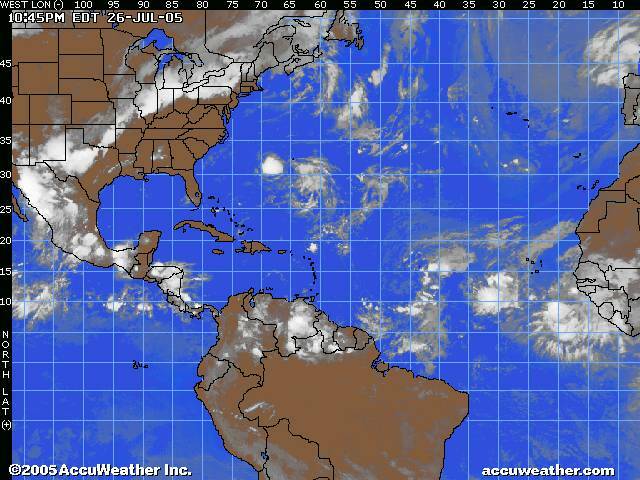 A look at the weather maps shows most of the Caribbean Islands in the clear. A broad band of clouds to our west doesn't appear to be "coming back to get us". The mess we've been under for the last 9 days is being pulled northward at about 30 deg east of north. Other "stuff" out in the far Atlantic might bring rain or clouds next week or maybe even drift north before reaching Nevis. A wet greeting that is! If you want rain we have rain. We are now into day 8 of clouds and rain with little improvement in sight. Looking at weather maps sure doesn't show any sun around these parts. 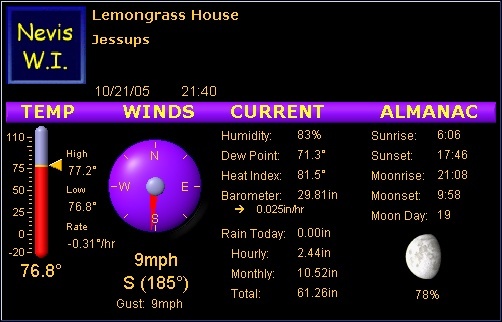 Sorry to report my weather station console decided to quit Friday evening so I have no rain amounts to report after 07-Oct-05. Oct 01 - Oct 07 I have archive date showing almost 4" between that period. I'd say over the weekend we received another 4" (most of it on the verandah). Days vacillate between cool air from the NE to humid air from the south. 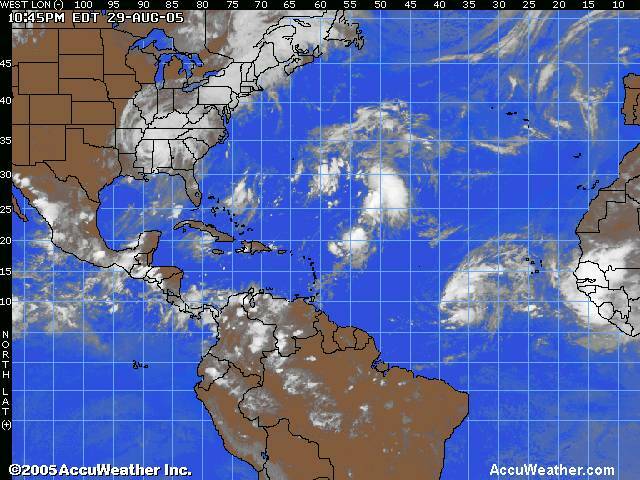 This sure is a strange mass of clouds hanging around the entire Caribbean. I attached four images looking North, South, East & West showing the mess all around us. Sunny weather will return sometime????? Weather this summer is proving to be very warm, at least it seems that way to me. I don't remember it being this hot in years past. 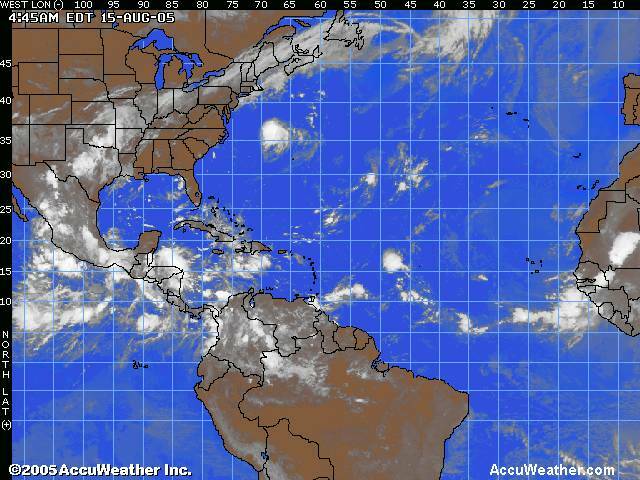 Thought for sure it would bring more storms across the Caribbean islands or at minimum some rain waves. We had a short shower last night, the first in 9 days. From the information I can gleam the African dust is playing a big part in stopping development of depressions to storms. Nature can be kind at times. Unfortunately the folks in the path of Katrina will never think so. My heart goes out to them. It's warming to see so many people of the world wanting to help. - To much shear ?? I know the NHC is saying (see below) there is no threat but those two areas (see attached image) are looking a little ominous to me. I see a ccw rotation, ever so slight. Maybe I'm getting a bit paranoid after Katrina. I'll watch & see! A tropical low pressure system is was located near 20 north and 56 west earlier this afternoon; this is in an area with too much shear for development now, but as the shear weakens over the next 24-48 hours, the low could become a tropical depression. This low is moving northwest at 10 knots; no threat to land in the immediate future. 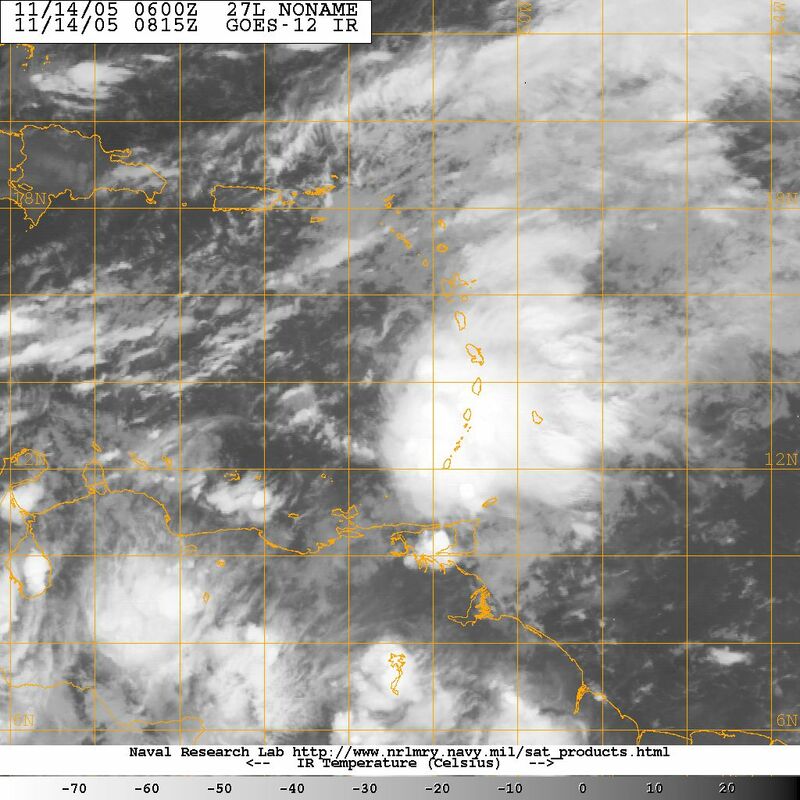 Another tropical wave along 93 west, south of 19 north, is moving west at 15 knots. 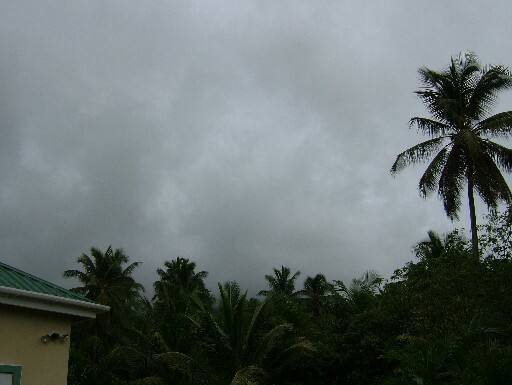 Looks like another batch of steady rain has descended upon Nevis & the surrounding islands. It looks like several days of great weather then a few hours of rainy stuff. From the animated images we should be back into fair weather by tomorrow or even tonight. Sooo....... visitors you'll have to sit this one out playing cards or a game of pool or belting down those Carib's. I like the Carib's idea !! All is quiet on Nevis (in more ways then one). Not many travelers here, not much to report in the weather dept. either. Looking at satellite images we are a long way from any storms. Days are sunny & hot, night might bring a shower or two. I attached a satellite image of the western hemisphere and you can see there isn't much between the Leeward Islands & Africa. Good to travel here if you want sun & heat! Nothing of importance to report. Just wanted to thank the fine folks on Montserrat for the dusting of snow we received yesterday. Oh sorry that was ASH. Those south winds will get you every once in a while. Just gleemed this info from Accuweather & thought I'd pass it along. Why at 12:30am? Bored I guess. Waves along 43 west, 74 west and 93 west are all south of 20 north and in no set up for development anytime soon. African dust still covers the northern and parts of the northwest Caribbean. Another area of dust is mixing in with the wave along 43 west. This dust is creating more of a capping environment and that explains why the Caribbean is so quiet. The GFS tries to bring the wave along 43 west into the Bahamas early next week. However, the wave is surround by dry air and that will make it difficult for development. Another strong wave has just moved off the coast of Africa and it has less African dust surrounding it. So, it could have a better chance at development in a few days. Emily has decided to go south which puts Nevis in the clear. We might not receive rain from this girls outer bands. Right now (looking out the window) some clouds with sun and some showers. Some photo's attached. Just some data from NOAA Hurricane Center & my remarks. The latest models predict a move south which puts Nevis on the very edge of the storm. We'll probley get see winds of 50 mph or less & for sure rain. This was based on their 12-Jul 5 am models. If things change much & as it moves closer I'll post more. Attached the projected storm path image for your look see. The rain continues today. 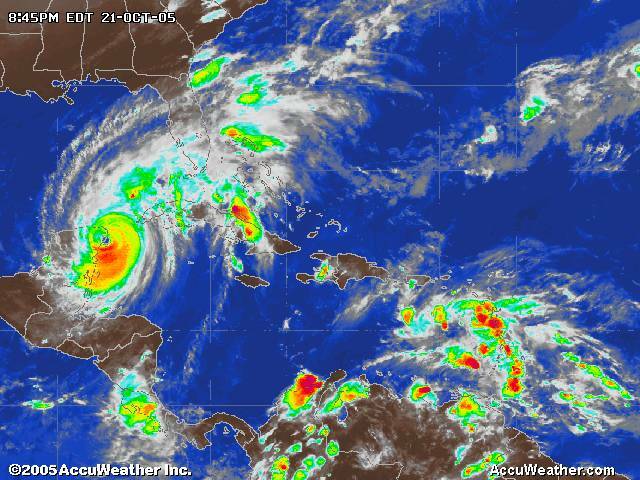 We did have a small reprieve yesterday afternoon for several hours but looking at the satellite images its unbelievable that hurricane Arlene is affecting our weather here in the Leeward Islands. 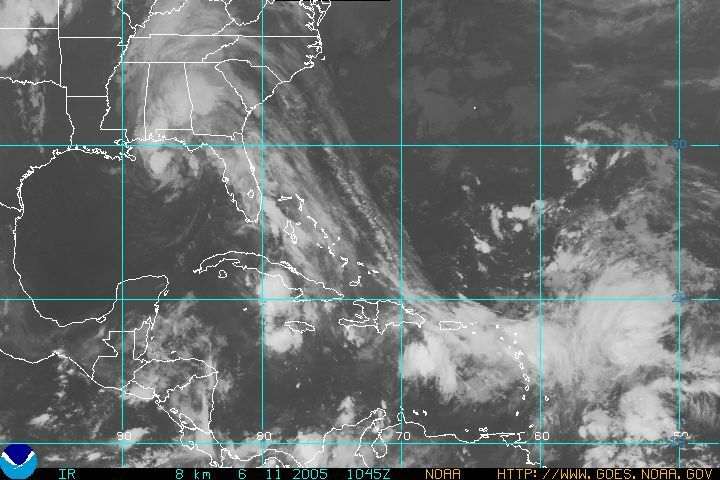 I attached the latest image where you can clearly see the pattern stretched from costal USA to the Caribbean. Yesterdays total rain fall measured 5.08" on the rain gauge. Temperature right now is a cool 75 deg F.
For those interested I use a Oregon Scientific Weather System, Model 918. Just as the weather satellite images show we are in the middle of the rain band. 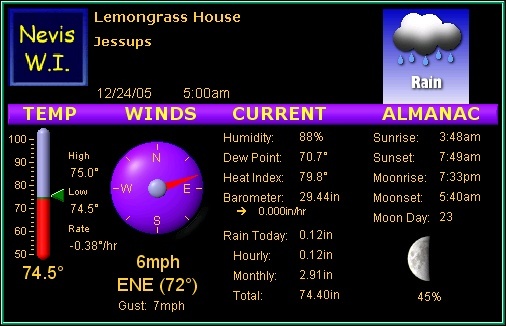 Since midnight we the rain gauge has recorded 4.60" of rain. All night it was a hard driving rain on the roof. Throw in some thunder & lightening to make it exciting too. 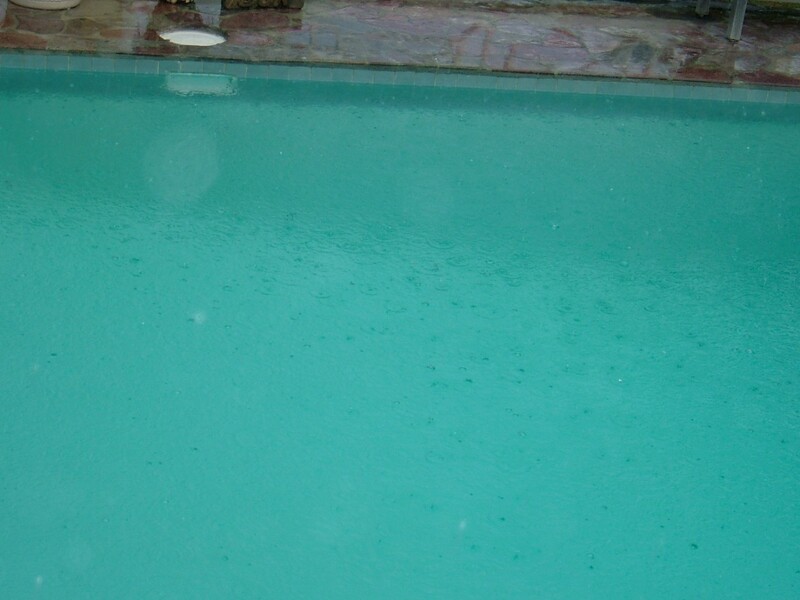 This morning the rain continues although not as heavy (right now) but I'd say we can expect another day + of the same. I'm sure there is localized flooding throughout the island. I can hear the roar of the water rushing down the ghaut from where I sit. Will try to get a handle on that and report back. I've attached a text file showing rain fall for June......so far. Wet & Wild here on Nevis. It's been brought to my attention by a fellow in NY I made a error (shame on me) on normal wind direction. I stated normal from NW. Not true....I should have typed NE. Normal direction (on the compass) is 30 deg to 50 deg. See the attached jpeg file for 'normal' wind direction. The prolonged hot weather with winds out of the SW has finally ended. Wind has changed around to its normal direction of NW. The SW pattern is the longest anyone can remember for May. Two weeks of 90+ temps just is not fun. Standing in the shade (no movement involved) will bring a sweat. Ah...those 85 deg days are just lovely. Fair weather has returned ......with a vengeance. Afternoon temps are at the 91-92 degree range. Quite warm for May. Hum.....we're now at the 5 year mark without a storm approaching Nevis. Just wondering if we'll be lucky again this year. It seems to me 2005 has been warmer then normal, to date, with sea temps 2-3 degrees above last year same time. 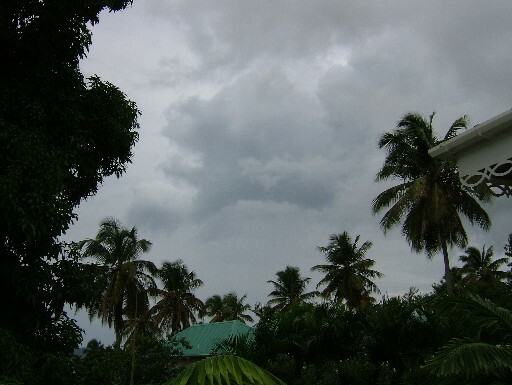 For those preparing to visit Nevis you can expect cloudy weather with periods of showers through the day and night. Looking at satellite images it's not going away soon. We've been in the soup for several days now & I'd say several more days will be the norm. Sorry about the bad weather news. Looks like the mini drought has ended. The last 7-10 days of April we have been blessed with rain. Most of that falling on two different days, April 24th and the 26th. Enough to refill those cisterns and bring back the "green look". It now seems more like normal weather with brief showers every now and then. Total rain fall for April measures 5.00 inches from the weather station rain gauge on the roof. Looking into the cistern is a less scientific way but that works for me!